Grass Turquoise Gemstone 10mm Round Beads (~40pce Strand) - 40cm /16'" Strand. 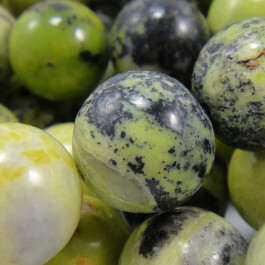 Grass Turquoise Gemstone 10mm Round Beads (40pce Strand) - 40cm /16'" Strand. In the ancient times this stone was worn in protection against an unnatural death, Turquoise is still worn as a protective stone today in some cultures, believed to bring honesty, fertility and success. More commonly resembled as a friendship stone and given as gifts.